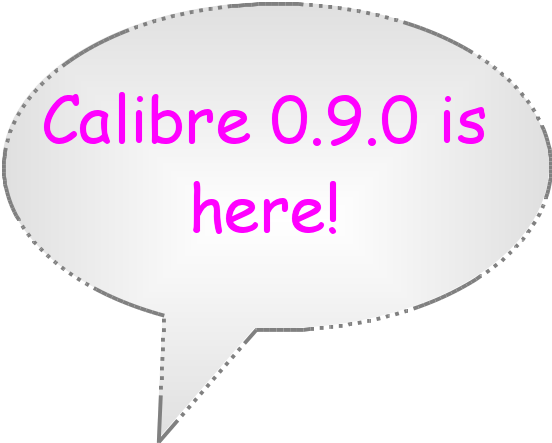 calibre tips and tricks: calibre 0.9.0 is here! 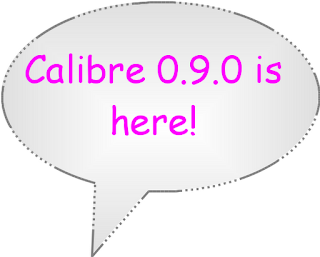 The long awaited calibre 0.9.0 is here! This is the link to the page documenting all the improvements since 0.8.0. Over the last year we have seen many new android phones and tablets flood the market. These devices double as readers and are used by many to read news and ebooks. Calibre has been adding support for these devices as and when they have appeared. While most earlier android phones and tablets presented a drive letter when connected via USB to the computer, many of the newer ones do not including the popular new Nexus 7. For those android devices that do present this drive letter, calibre has been able to detect the device when it is connected to the computer and transfer e-books to and from it. It can also connect to it wirelessly using the over the air method explained here. This wireless method requires setting up the calibre content server. However many new android devices do not present a drive letter when connected by USB to the computer. These devices use something called Media Transfer Protocol (MTP) for data transfer. Prior to calibre 0.8.53, calibre could not detect these devices via the wired USB connection. Also some people had trouble setting up the calibre content server to connect to them wirelessly. We realized it was important to improve the support for these devices. Now calibre can connect via USB to even those devices that do not present a drive letter. A lot of you were waiting for this feature and now it is here. You can use calibre to manage your ebooks on your android phones or tablets just as easily as you did on your sony readers, kindles, nooks etc.Unfortunately we have not been able to get this to work with OS X but it does work with Windows and Linux. When you connect an MTP device like the Nexus 7 to calibre, a device icon like the one in the above picture shows up in the tool bar. You can see what books are on the device by clicking "Show books in main memory of this device". All books in your library which are also on the device will be marked with a green check mark when the device is connected by USB to your computer. You can right click on any book in your library and it will give you the option to send to device. Many of you have also been asking for a calibre app for wirelessly connected android devices. For this we recommend a new app called Calibre Companion. Charles Haley, who has made significant contributions to calibre's code, is one of the developers of Calibre Companion. Calibre Companion is two applications in one. The first: Calibre Companion supports connecting to calibre over WiFi and be detected by calibre as a device. All calibre device operations are supported, including sending books and metadata, cover thumbnails, deleting books, sending news, and plugins like Reading List. You can specify where different book formats are to go on your device, e.g., epubs in one folder, pdfs in another, and mobis in a third. Most setup is on the device, making it easy for different users in the same household to have different device configurations, or to use more than one computer running calibre. Sort books by title, author, series, date changed or read, with both ascending and descending sorts. Group books by title, author, tags, series, publisher, and most calibre custom column types; including optional navigation by first letter. View a "book jacket" showing all the details of a book, including calibre's custom columns. Launch your book reader application to read a book (works with most reader applications). Search for books using calibre-like search syntax. Scan your library folders for books not in Calibre Companion's database and adding them. This process uses calibre to help get the highest quality metadata available. This app is supported on the calibre devices forum at MobileRead. Calibre Companion is sold for $2.99 all the proceeds of the sale go to a company called MultiPie Ltd. Calibre Companion is not made by calibre's primary developer Kovid Goyal and he does not receive any of the income generated from it's sale. Calibre is primarily an ebook format conversion and library management program. But it has an inbuilt viewer. 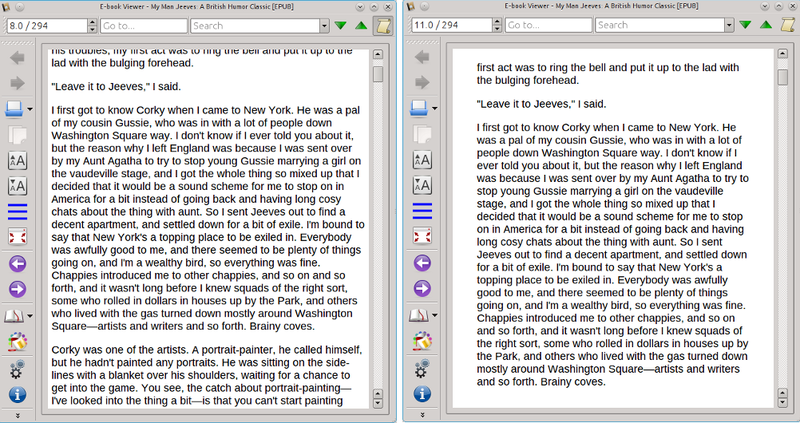 The viewer allows you to read your ebooks even if you do not own a dedicated reading device or if you just want to read on your computer. The calibre viewer supports a myriad of formats and we have already done a detailed blog post on its various features. The last year has seen a number of significant and popular improvements to the calibre viewer. Although ebooks have been excellent for regular text there has been some problems with including math in ebooks. The calibre viewer can now display math embedded in ebooks (ePub and HTML files) extending it's functionality to reading scientific and technical content. To create an ebook with math you can typeset the math directly with TeX or MathML or AsciiMath. 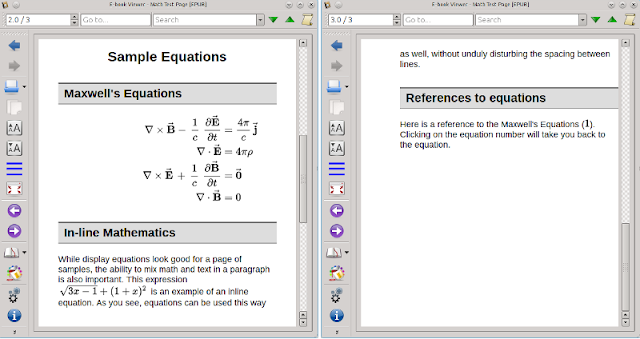 The calibre viewer uses the excellent MathJax library to implement this feature. For more information on this feature click here. Caveat: The calibre viewer supports displaying math, but this does not mean that your ebook reader can display the math. Here is an example. This HTML code has been converted into epub by calibre. The screen shot of the epub file on the calibre viewer follows. The calibre viewer now has a page mode. In this mode the scrolling is disabled and the content is broken up into discrete pages. The bottom or top line is no longer cut off. The white page turning arrows inside the purple circles on the left toolbar have to be used to turn pages. To disable page mode click on the same icon again. The following picture shows a comparison of the viewer display in scroll mode (on the left) v/s page mode (on the right). As you can see, in scroll mode the top line is cut off while in page mode it is not. 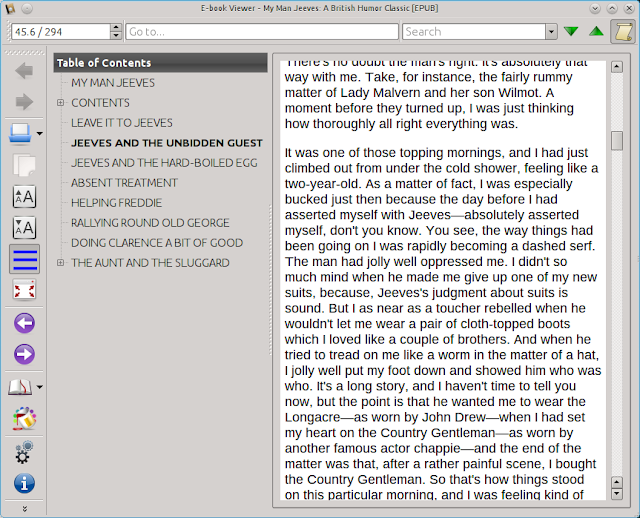 The content displayed in the viewer is from the chapter "JEEVES AND THE UNBIDDEN GUEST" which is in bold in the table of contents panel. In the main calibre window you can search for books by entering into the search bar any word included in the book's metadata. If any word in the metadata has an accented character like "ë" for example you can just enter "e" in the search bar. This is not just true for author names but for all entries in the metadata. 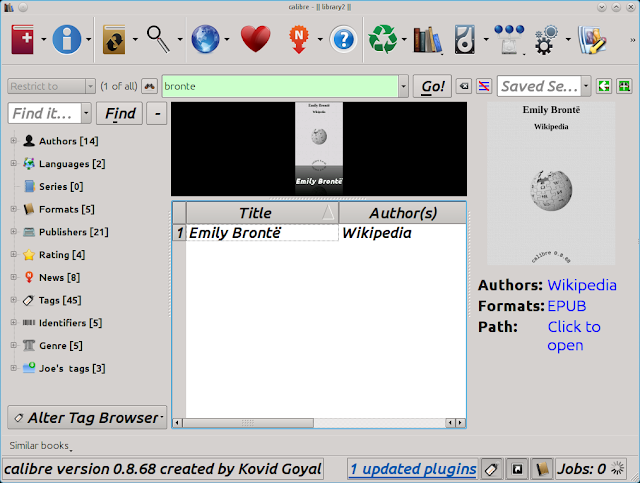 The following picture shows how you can search for an ebook titled "EmilyBrontë " by just entering "bronte" in the search bar, i.e simply "e" instead of "ë". The Wiki Reader plugin allows you to create an ebook of pages from Wikipedia by entering the URLs of interest. You can give the ebook a title of your choice. If you do not enter a title it will just use the title of the article corresponding to the first URL. The ebook will have the same table of contents as on the wiki page. The author is set to Wikipedia and the cover page has the wikipedia logo. For details on usage click here. Here is an example of an ebook created with the wikipedia pages for e-book, e-book reader, DRM and calibre where the viewer is displaying the first page of the calibre wikipedia article. As you can see the highest level of the table of contents (TOC) just has the titles of the four articles. The sub-levels are generated from the TOC of the particular wiki page. 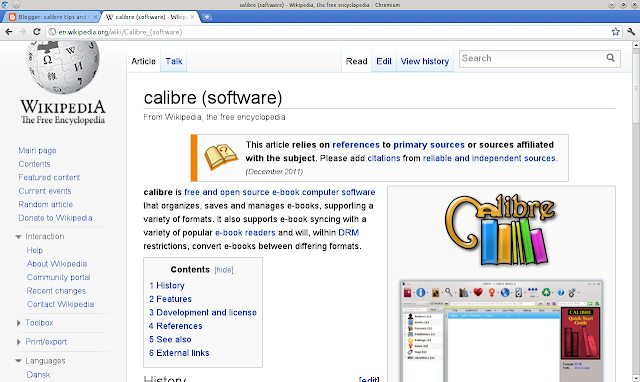 Below you can see the TOC on the calibre software wiki page and compare it with the sections in the TOC under calibre (software) in the above picture. Other similar plugins include Recipe Reader, Medical Reader and Hymn Reader. The Recipe Reader allows you to make an ebook of recipes from cooks.com by entering the URLs of interest from the cooks.com website. The Hymn Reader allows you to make an ebook of hymns from Hymnwiki by entering the URLs of interest from the Hymnwiki website. Column coloring: Column coloring allows you to set up conditions to have certain entries in certain columns appear a certain color. Calibre portable:This version of calibre can be put on to a USB stick and carried around with you. The USB stick would contain both the calibre installation as well as the calibre library. It can be then plugged into any windows computer and used to access the library on the stick with calibre. Auto clean up of news downloads: This is a powerful feature that enables lay users to make custom recipes. You may be interested in making a single news recipe that has RSS feeds from different blogs and news sources that you visit. This can be done quite easily with "Auto clean up". To summarize 0.9.0 has lots to explore and enjoy. I have not written a blog post in a while. This is mainly because most of the important topics have already been covered. But as and when something interesting comes up I will try to cover it. Since you first drafted this post Calibre Companion's write-up on Google play has improved. You might consider updating this post. ¡Felicitaciones por el tremendo programa que es calibre! I know that this might be an 'old' question,but could you explain to me how to bulk convert all of the non Mobi books I have stored in my Calibre library to Mobi to read on my Kindle.